Who is Matt? Well, Matt was sitting in the back of the classroom when we began our cave class at Cedam Dive Centers in Puerto Aventuras. He was pretty quiet. The next day, we were told we would be diving with our instructor, Dan Lins, and Matt. We still had no clue as to his exact role in the program, but it was clear that he was involved in our class by design. His role became rather apparent the first time he critiqued our performance. He was there to help us learn, and he took it seriously. He remembered every detail of our every movement during each dive. During the course of this class we learned that Matt's imposing size and serious look when talking about the importance of not making mistakes were well balanced by his big grin, and his enjoyment of working with students. At first, we thought his serious side dominated, but we soon figured out that we influenced that with our mistakes. It quickly became apparent that his serious delivery of technical messages was totally unrelated to his gentle personality. He grinned a lot when he told us that he remembered when he took his cave class. He knew we weren't satisfied with our skills yet either, and he wanted to let us know that it was OK, but without saying so. Matt is a Technical Diving Instructor at CEDAM Dive Centers, and is working on his cave instructor certification. 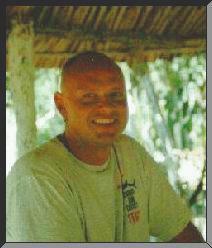 Anyone who is interested in technical diving in Puerto Aventuras would do well to look him up. He is an instructor in several technical fields. Matt is available to teach, or to guide. During the last couple of days of our cave trip he was doing some deep ocean diving with a visitor. We still enjoyed his grin when we ran into him at the shop. On our last day at Cedam Dive Centers we saw the biggest of Matt's trademark grins as he said "You earned your license to get your education.". Matt has a lot of wisdom. We hope to dive with him again soon.